We are happy to introduce one more young Revgear Champ. Aalijah Pineda is 6 years old and lives in Cypress, California. She trains Brazillian Jiu Jitsu at Gracie Barra in Garden Grove California. She trains 4 days a week. She comes home and still wants to train! Aalijah says she wants to win a championship belt on T.V. when she grows up. She loves MMA fighting, and her favorite fighter is BJ Penn. She wants her nickname to be "The Prodigy". 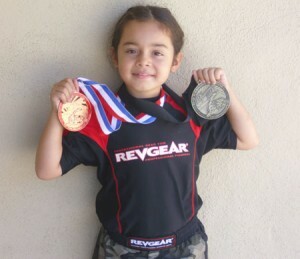 Recently she won first place at BJJ Championship for Kids and Teenagers at Riverside, California. This weekend she competed in the Best of the West OTM tournament in Anaheim, California. Aalijah took gold in the 49 lb Gi-division with GI and Bronze in the No-Gi 49 lb division.